Imagine living in a ghost town, where the slightest sound of a footfall or a conversation could ensure you are ripped apart by merciless, mysterious monsters. Anyone would die out of sheer paranoia living in such a place that is infested with monsters who attack its prey just by sound. 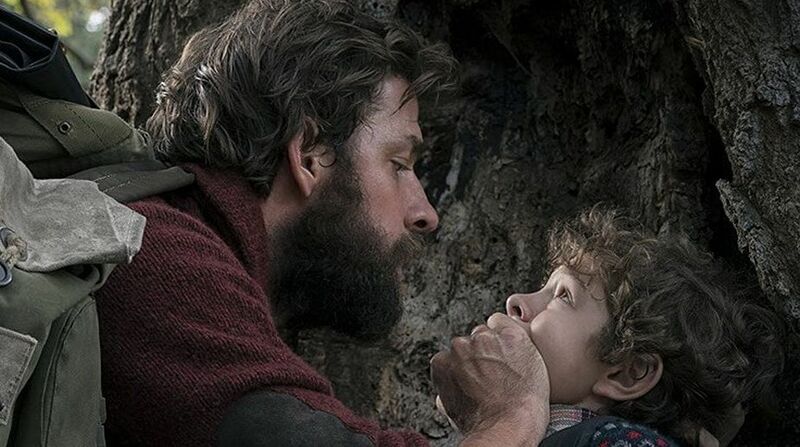 Thus living in silence is the only mode of survival in Director John Krasinski’s cinematic universe – A Quiet Place. Set in a dystopian future with a card that reads 89th day, the film opens with Lee and Evelyn Abbot along with their three children – Marcus, Regan and Beau, all barefooted, rummaging through a dusty general store for supplies. They only communicate through sign language and hushed whispers. The reason for their cautiousness becomes apparent when moments later, while walking in a single file over a sand laden path, young Beau turns on a battery-operated spaceship that was stealthily given to him by his sister. We don’t need to see the gory aftermath to understand his fate. Nor do we know exactly what happened. Nearly a year later, heartbroken and empty they have an obligation to each other to stay alive and stay quiet. Over dinner, they speak in sign language and use lettuce leaves instead of heavy plates or replace every sound creating item with felt or yarn baubles. But, somewhat more challenging than the sounds, is when Evelyn becomes pregnant and is due for delivery. What adds to the drama, is the eldest daughter Regan who is deaf and with a broken hearing aid. She isn’t aware when she’s making noise, adding a dangerous sense of the unknown to her arc, as she is blissfully unaware when she may be at risk. Lee uses an effective technique to educate his son and daughter while never letting them forget how dangerous their lives are, raising them to be normal and happy but hyper-vigilant about the circumstances they live in. The screenplay is taut and keeps you hooked. It is difficult to deny its creative brilliance. Its calling card is its subtlety. With minimal dialogues for exposition, the jolts of absolute terror are intelligent and scary, in a forced setting. What elevates the viewing experience is its intriguing production values which Director Karsinski astutely uses to his advantage. He uses visual cues to tell his story. The monsters are petrifying and are designed intricately like a huge spider whose head opens up, petal-like to reveal huge intricate ears and rows of menacing sharp teeth. With sound being a prominent narrative device and that being eliminated, makes it even more prominent and terrifying, for when situations are beyond ones’ control.